In a recent survey of logistics executives, we asked them to name their biggest challenge related to warehouse labor management. Reducing labor costs? Increasing productivity? While those were on the list, the #1 response was finding and keeping qualified workers. The most recent Third-Party Logistics Study, sponsored by CSCMP, talks about a shortage of trained individuals to replace a rapidly aging workforce in trucking and warehousing. 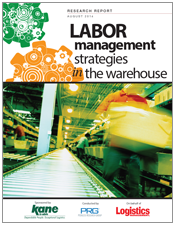 Manufacturers and 3PLs who used to be laser focused on operational strategies and execution now need to develop softer skills in warehouse labor recruitment. The smartest strategies mean little without skilled, dependable workers to carry them out. Interestingly, the same study found that shippers and their 3PLs have a disconnect when it comes to the industry’s readiness to address the labor challenge. While 52% of shippers feel they can rely on 3PLs to address any labor shortages, 79% of 3PLs reported that they are worried about the negative impact of a tighter labor market in the supply chain. With all the automation and software advances that have transformed supply chain management in the last two decades, one thing has remained true: superior logistics execution eventually comes down to trained people committed to doing the right thing in the right way. If you manage a logistics and warehouse labor force and people recruiting and retention is not yet a strategic focus, it’s just a matter of time before labor challenges erode your logistics capabilities and competitive position.